SCORPIONS “FACE THE HEAT” – AN UNDERRATED & CLASSIC 1993 ALBUM REVISITED! SCORPIONS – Back on September 21, 1993, the Scorpions released Face the Heat on Mercury Records. This was studio album #12 from this beyond legendary Heavy Metal Band. On June 19, 2010, Best Metal Buddy, Scott Coverdale slid his Face the Heat CD into his Mercury SUV CD player… as we embarked on our journey to the 2010 M3 Rock Festival in Columbia, Maryland. Scott was not the least bit bashful at playing Face the Heat extremely LOUD on our ride and I was NOT complaining. This is one highly underrated Scorpions album, quite possibly due to it’s being released back in 1993… when Heavy Metal was supposed to be a hurtin’ and dried up genre and scene. (Yeah, right, whatever). The opening track – Alien Nation, is one absolute powerful and thunderous listening experience of Scorpions Heavy Metal. The rhythm section alone is high octane/psyche-you-out detonation to the maximum level. Alien Nation is easily one of my favorite Scorpions songs ever recorded and I’m sure Scott feels the same way too. If there was to be that one Scorpions song that seemed to set the Metal tone on that ride to M3, it’s certainly Alien Nation. Metal be thy name can this song lift my mood to an unreal high. Under The Same Sun is another standout song on Face the Heat. This song is a power ballad, one that is inspirational and yes… emotionally uplifting. The basic theme of this intelligent and melodic song is: if we all live under the same sun, then why can’t we all live as one? Yes, a philosophical question does rear it’s mighty ethical head from Under The Same Sun, only it is an almost magical thought to digest. There is a hidden track at the end of Face the Heat and it does not appear until a few minutes after the CD comes to a close. One must keep the CD on play and not hit the stop button in order to hear this Rockabilly style song from the ever iconic Scorpions. Yes… it’s a Rockabilly song, taken from the mold of the historic and also legendary Queen and their classic song – Crazy Little Thing Called Love. When my ears first became introduced to this hidden track, it was around ten years ago, right around the time my twin daughters were born. I can actually recall that moment I first heard this song… it was as if I discovered a real gold nugget alongside a river bank! Truth be told, it only took me about seven years to discover this hidden track! I had owned Face the Heat since it’s year of release too, never knowing about the hidden track for so long. Gee Metal whiz. Face the Heat proved to be a winner of a choice for Scott Coverdale to choose for our ride to the 2010 M3 Rock Festival in Columbia, Maryland. It was great to become reacquainted, once again, with a true classic of a Scorpions album. The overall heightened and Arena Style, Heavy Metal sound on Face the Heat is what makes it so memorable for me. This Scorpions album is not as “modernistic” as some “professional” reviews have alluded to over the many years since it’s release, in my Metal opinion. 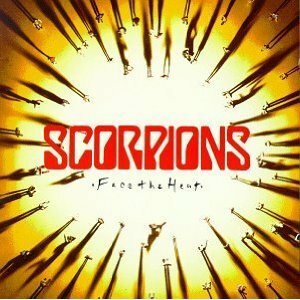 If you have never listened to Face the Heat, I urge your doing so, especially if you are a new fan to the Scorpions. I am not endorsing Face the Heat as the greatest Scorpions album of all time, what I am endorsing here is a Scorpions album that should garner the attention and respect it so justifiably deserves. Any fan of Old School, 1980’s or 1990’s Heavy Metal should appreciate what the Scorpions created with Face the Heat – a quality album of melodic Heavy Metal songs. This CD is readily available just about everywhere online… from Best Buy to Amazon. * Metal Odyssey Notes: This Face The Heat CD I have always owned, is an original American release pressing. Therefore, I do not know if this hidden track is found on any imported version or re-mastered re-release. I do not know the title of this hidden track, it is not found anywhere within the liner notes of Face the Heat, that I own. If anyone out there knows the title of this hidden track, please comment it! This entry was posted on June 23, 2010 at 9:31 am and is filed under Hard Rock, hard rock albums, hard rock bands, hard rock music, Heavy Metal, heavy metal albums, heavy metal bands, heavy metal history, heavy metal music, metal odyssey, Music, rock 'n' roll, rock and roll, rock music with tags 1970's heavy metal bands, 1980's heavy metal bands, 1990's heavy metal bands, current heavy metal bands, face the heat album review, hard rock music, heavy metal album review, heavy metal history, heavy metal legends, heavy metal music, metal odyssey, Music, old school heavy metal, rock music, scorpions alien nation song, scorpions heavy metal band, scorpions hidden rockabilly track. You can follow any responses to this entry through the RSS 2.0 feed. You can leave a response, or trackback from your own site. I agree this is a great Scorpions album, not there best album but IMO better then ‘Crazy Nights’, it is a good fun metal album. However… I will take “Face the Heat” over KISS – “Crazy Nights” any day of the year! The more I keep listening to “Face the Heat”, the more I realize that those “90’s were NOT so dreadfully dried up with great Heavy Metal after all. Thanks for your cool insights recently, it’s appreciated and welcomed. Now i have to dig up my face the heat album. I had long neglected that one for for some reason.. i didnt even like the cover art. Crazy World was too much of a change for me.. i didnt like the new direction they were taking with it. I caught the Scorpions live at the M3 Rock Festival this past June, in Columbia, Maryland. Wow were the Scorpions EXCELLENT!! I posted all about it right here on Metal Odyssey. I agree, “Sting In The Tail” is a great album… I can’t stop listening to it… and it psyches me out!! Bob, thanks a ton on identifying that “hidden” track!! It is appreciated. Whoa… Elvis… that is very cool info to “finally” find out after all these years!